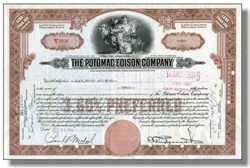 Beautifully engraved certificate from the Potomac Edison Company issued in 1946. This historic document was printed by the American Banknote Company and has an ornate border around it with a vignette of an allegorical woman and child holding a light generator. This item has the printed signatures of the Company’s President and Secretary and is over 57 years old. Potomac Edison operates its electric distribution system in portions of Maryland, Virginia, and West Virginia. In all jurisdictions, Potomac Edison is doing business under the trade name Allegheny Power. Potomac Edison serves about 402,000 electric customers in a service area of about 7,300 square miles with a population of about 782,000. In August 2000, Potomac Edison transferred its generation assets and its interest in AGC to Allegheny Energy Supply pursuant to state legislation and regulatory proceedings. There are four municipal electric distribution systems in its service area, all of which purchased power from Potomac Edison in 2000, and six rural electric cooperatives, one of which purchased power from Potomac Edison in 2000. Allegheny Energy, Inc. is a diversified utility holding company, which owns, directly and indirectly, various regulated and non-regulated subsidiaries. The Company conducts its business through its direct and indirect wholly owned subsidiaries. Monongahela Power Company (Monongahela), The Potomac Edison Company (Potomac Edison) and West Penn Power Company (West Penn) are electric distribution (or delivery) companies (the Distribution Companies). Allegheny Energy Supply Company, LLC (Allegheny Energy Supply) is an unregulated electric supply company that is expanding its electric generation fleet. Allegheny Ventures, Inc. (Allegheny Ventures) is an unregulated company that develops and operates telecommunications and energy-related businesses through its subsidiaries. Allegheny Generating Company (AGC) is an indirect subsidiary whose only asset is an undivided interest in a pumped-storage hydroelectric station. The Company also owns exempt wholesale generation (EWG) subsidiaries.